This is an experiment. I believe it has potential, but there are details to iron out. 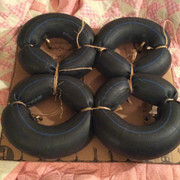 I need a spare wheelchair cushion, especially for the day and a half when I have to wash my Roho brand wheelchair cushion and cover — in my sink, and while they are air drying. When washing at the sink, I’m in pain without the cushion. 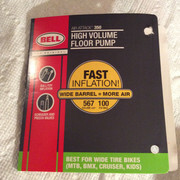 Also, I’m several inches “shorter” without the cushion, making it more difficult to reach the faucets and the sink. There’s just no way around it. I need a spare cushion. But new Roho cushions cost at least $450. 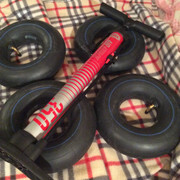 So, I spent $12 ($3 apiece) on four small “lawn mower tire” inner tubes, and $10 more on a bicycle tire pump. 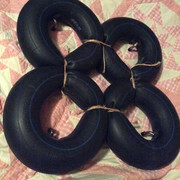 Now, I’m off on an adventure to see if I can cheaply make an inflatable cushion that with serve as a suitable substitute for my $450 Roho cushion. 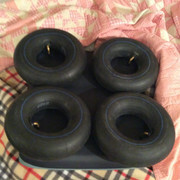 I saw that the 4.10/3.5 inner tubes I bought cover an area a little larger than the size of my old gel wheelchair cushion. 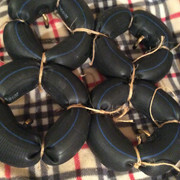 To reduce the size of each inner tube, I tied twine at four spots around the perimeter, and then inflated the tube. And here it is right-side-up. I have a homemade cushion cover somewhere around here. 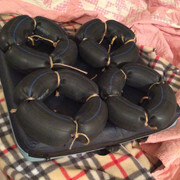 Tomorrow, if I can find it, I’ll try out my new DIY inflatable cushion. Update: Today, I am sitting on my DIY inflatable cushion. It does work, but it is “wimpier” than I had expected. Maybe I could make a second cushion and stack it on top of the first one. 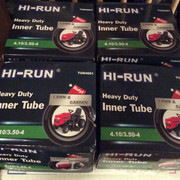 I have removed four of the outside ligatures and re-inflated each inner tube. The cushion is much less “wimpy” now. Also, I cut a cardboard pattern to the exact measurement of the bottom of my Roho cushion, so that I can do a better job of making a facsimile. The three dimensional measurements stated on the Roho cushion are: 18.25” x 16.50” x 4.25. 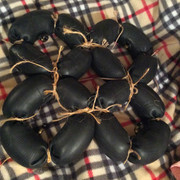 Or, 46.5cm x 42.0cm x 10.5cm. And another tweek... I’ve remove the two outside ligatures that were still left. I tried out the previous version this morning and the cushion was still smaller than my Rojo cushion, plus I had it over-inflated, so that it was too firm. My DIY cushion is now softer and a little larger.